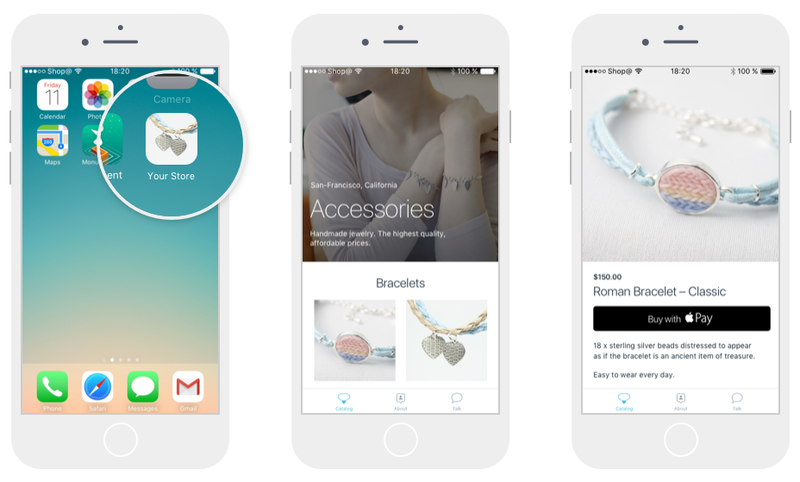 Wouldn’t it be cool to turn your online store into a mobile app? It probably seems complicated and expensive, but it’s actually easy and affordable. And Ecwid can do it for you! We implemented this idea for our users because the mobile phone is such a significant part of our lives today. We spend a lot of time with mobile devices in our hands, even at home with desktop computers and laptops right beside our phones. If you’re not holding yours right now, it’s probably in your purse or pocket. 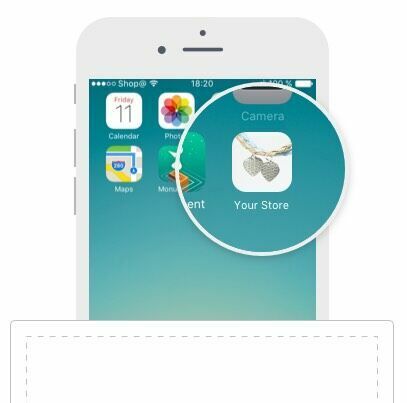 It’s very important to have an ideal mobile shopping experience for your customers. That’s why we created ShopApp — an automated retail app solution that allows every Ecwid store owner to sell their products via native smartphone apps. It is fully responsive, meaning your store will look great on any device, and your customers will have instant access to your inventory. They can shop your store more easily than ever before. After you apply to the program, we will build your app and place it in the iOS App Store or Google Play for your customers to download. There’s nothing left to do after that, except wait for your customer purchases to come in. How cool is that? With ShopApp, every Ecwid store owner can publish a professional native mobile app for their customers to download from the App Store or Google Play, and make an order right on the phone. 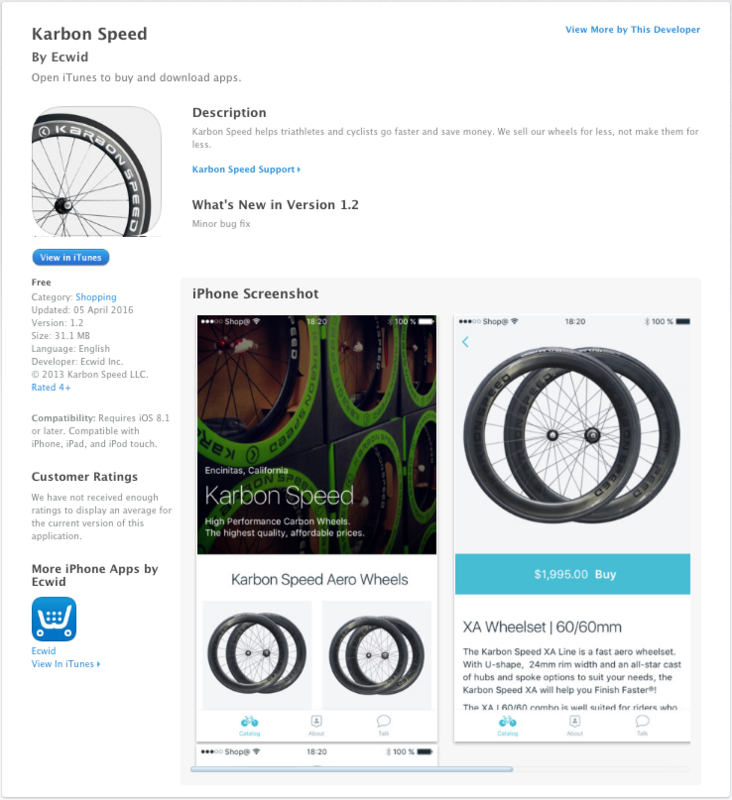 The first mobile app we created was for Chris Evertsen, the owner of Karbon Speed. He sells handmade bike wheels and other cycling accessories via Ecwid. The Karbon Speed app shows a full catalog, some information about the business, and various ways to get in touch. You can see it all for yourself by downloading the iPhone app or Android app now. The apps have all the basic features necessary for a successful e-commerce operation. The ability to buy products via Apple Pay – a simple way to make payments from an iPhone. If Apple pay is turned off, the Buy button will redirect to the web-version of the store where customers can complete their orders. ShopApp is included for all ANNUAL UNLIMITED users. Fill out this form – specify your email and Ecwid Store ID. Then we will begin working on your app. This process usually takes 3-4 weeks. After that, we will submit the app to the App Store and Google Play. At this point, the app is live and ready for your customers to download. We believe ShopApp will bring convenience and opportunity to you and your customers. If you have any questions or ideas, email us at shopapp@ecwid.com and we’ll respond as quickly as we’re able.